This week is Thanksgiving, and it is my favorite holiday. Thanksgiving is not about religion or patriotism or buying candy or guilt; it is a celebration that combines eating well with enjoying our friends and family while expressing gratitude to and for the people who made us who we are. And so, I want to thank a whole bunch of people who shaped my life in unforeseen ways, the kind folks who overlooked my otherness by perceiving me through their ears rather than through their eyes, the ones who accepted me as a sorta Chinese person, someone who was no longer one of Them, but rather one of Us. Chinese people have this strange reputation for being aloof and inscrutable, and yet only those who never counted Chinese among their friends would ever think of saying that. They are, in fact, some of the warmest and most loving people in the world. And they feed you. Oh my, how they feed you. These friends not only taught me how to relish great foods from all over China, but more importantly they welcomed me into their kitchens and their lives. I'm talking in particular about the good people of Taiwan, and even more specifically about the Mainlanders who came to call that island home after the mass exodus with Chiang Kai-shek in 1949. My memories of these friends seem to inevitably swirl around food. Maybe it's because aromas are so evocative and can summon up old memories like nothing else. While cold winds blow outside this afternoon, a bubbling sandpot on the stove reminds me of how winter in Taipei used to be my idea of heaven, for it meant that I could hunker down to great, warming meals after work and lose myself in simple but sensual pleasures. When left to our own means, my husband and I invariably gravitated to simpler places that specialized in homestyle dishes, honest foods that spoke of lands on the other side of the Taiwan Strait that were left behind when these cooks fled, sometimes very much alone and always away from the sound of gunfire. Taipei in the late Seventies and early Eighties was filled with many such people, mostly middle-aged men and women who often had married local Taiwanese. The gentleman who taught me how to paint in the Chinese style was just such a person. He started out life as an orphan after someone or other had bombed his village in rural Henan. Just a little boy when he climbed out of mounds of rubble and dead bodies, he followed a stream of refugees to a city, where he found work in a bookstore; that became his apprenticeship, and that saved also his life, as these kind people took him in as one of their own and even brought him to Taiwan when the Communists took over. As the years passed and he became a comfortable burgher in his own little shop with his own little imprint, his life settled down into a quiet coda like so many of his generation. He and his friends had grabbed at whatever ropes had been flung their way, counted themselves lucky, saved their pennies, and yet always gave their own little families every comfort possible. These were admirable folks, true salt of the earth, and their stories were heartbreaking and beautiful once they trusted you enough to open up. Before that would happen, though, clues about their former lives would seep out in the ways they dressed and spoke, and especially in the way they prepared their food. And so, when we were hungry, my husband and I would more often than not enter a small restaurant where the cook was a Mainlander of some sort, and then revel in the mysteries of dishes that tasted of some far-flung village, some huge metropolis, or some forgotten fishing village. When we were really lucky, we would find an overlooked gem of a place that offered bowls of memories, steamy dishes that spoke of generations of grandmothers stretching back through the ages, and chipped sandpots filled with fish and sorrow and happiness. 1. This dish can be enjoyed the same day that you cook it, but is much better the second day. Rinse the fish head under cool tap water in a colander and then pat it dry with a paper towel. Place the pieces in a medium work bowl and toss with the soy sauce and rice wine; let the fish head marinate while you prepare the rest of the ingredients. Have a wok ready, as well as an 8-cup covered sandpot or casserole. 2. Heat a wok over high heat and then add the oil. Toss in the ginger and green onions, and stir-fry them until they are browned; scoop out the ginger and green onions, and place them on the bottom of the sandpot. Add the pork belly to the wok and stir-fry that over high heat until it too is browned all over, and then add that to the sandpot. Then, stir-fry the bamboo shoots and mushrooms over high heat until they are lightly browned before tossing them into the sandpot. 3. If oil has collected in the bottom of the sandpot, pour it back into the wok and then turn the heat down to medium-high before starting to brown the fish heads: you will need to do this in two batches. Fry the head pieces skin side first, and then when they have browned (but not before), shake the wok to loosen them before turning the pieces over and frying the other side. Add the browned pieces to the sandpot and repeat with the rest of the fish head pieces until done. 3. Add the chili pepper to the sandpot along with the 2½ cups chicken stock, ¼ cup rice wine, 1 tablespoon soy sauce, and rock sugar, bring the sandpot to a boil, and let it simmer for about half an hour. If you are serving this the next day, remove the sandpot from the heat and come to room temperature before covering and refrigerating; slowly warm it on the stove before proceeding to Step 5. If you are serving this the same day, then simmer the sandpot for another half hour before going directly to the next step. 4. Bring a large pot of water to a boil and add the salt while you prepare the dried mung bean sheets, bean curd, and cabbage. Cut the bean curd in half and then crosswise another 5 or 6 times to give you 10 or 12 pieces. Prepare the cabbage by cutting it in half and removing the core. Cut the leaves into 1-inch square pieces. First, simmer the bean curd in the pot of water for about 10 minutes to remove the excess liquid and to firm it up; use a Chinese spider or slotted spoon to carefully lift out the slices and place them in the sandpot. Then blanch the cabbage until it becomes slightly translucent; drain it in a colander set in the sink, and then add it to the sandpot along with the remaining stock. Shake the sandpot gently to stir, and then serve piping hot. For this reason, serve carp heads only to adults and only to people who will eat carefully. Granted, the flavors here are very much worth the price of admission, which is caution on the part of the cook and the diners. On the right are three of these bones from different types of carp. Pluck them out and discard them. 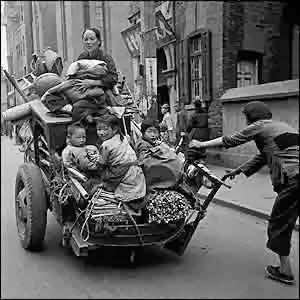 Refugee photo by Jack Birns, 1947, Shanghai; courtesy news/bbc.co.uk.